A passion that has lasted for four generations. 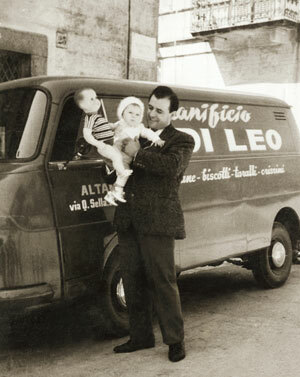 The Di Leo family history is one of simple ingredients such as passion for their work, the desire to grow and innovate while respecting tradition, the desire to pass on values ​​and skills down the generations. The story begins in the mid-19th century when Francesco Di Leo opened his bakery in the town of Altamura, beginning to bake bread which had been prepared at home by his fellow citizens, as was common at the time. 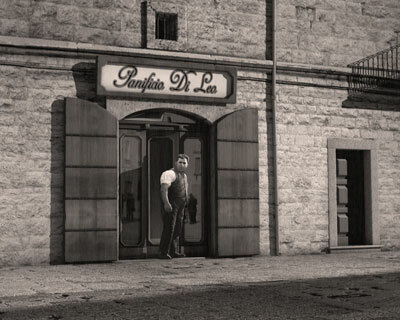 Then during the 1930s his youngest son Pietro began to produce and sell his bread, founding the Panificio Di Leo. With the next generation, in the early 1960s, in came typical craft products such as taralli, milk biscuits and party sweets. This choice proved successful, so much so that very soon their work transformed into a fully-fledged company, Di Leo Pietro s.n.c. belonging to Domenico and Vitantonio Di Leo and moved to a new location to start industrial production. During the 1990s, the company made its final move the existing plant, where the company started up large-scale production. Di Leo Pietro SpA, now run by Pietro Di Leo, is an expanding company, whose operations are guided by a philosophy that combines the advantages of the latest technologies with the use of high-quality raw materials, together with compliance with production techniques inherited from an ancient craft tradition. First of all is the wire-cutting technique which uses a denser mix that is poured into the mould, just like a pastry syringe, making the surface of the biscuit rougher and more porous, which means it can be dunked into liquids for longer without crumbling. Cameron Building Maintenance →← Vin Nova s.r.l.